Small condo units make for convenient halfway homes for singletons and bachelors, but what if you had to fit four people in it? 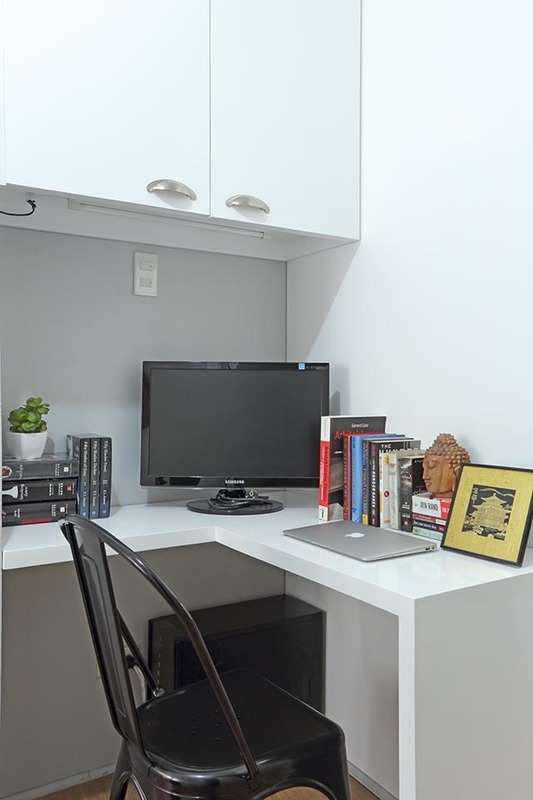 Such was the case of the couple Maf and Lon Samala, who share their condo home with their one-year-old son and his yaya. Interior designer Van Acuna-Solana stepped in to work on this makeover, and the first thing she did was to address the layout and choice of furnishings. 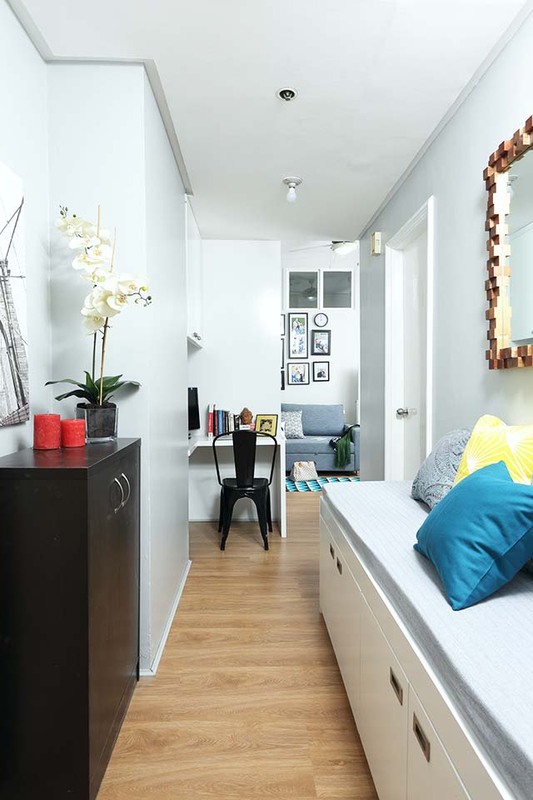 “Medyo crowded, tapos mix-and-match yung furniture so parang hindi nagbe-blend lahat,” the designer relates. Paint the walls all in one, light color. You could see through all of the living areas from the door, so Van replaced the old, cream-colored walls with a coat of refreshing, light gray and white paint, and used this throughout the space for continuity. And while Lon requested for a black color palette, Van advised against it, as such a dark color would overwhelm the space and wasn't appropriate for their toddler. The couple requested for a small, permanent bed for their son’s yaya (top photo and above). Van was able to squeeze in a proper daybed with storage at its base. It also serves as an occasional seat in the foyer area during the day. 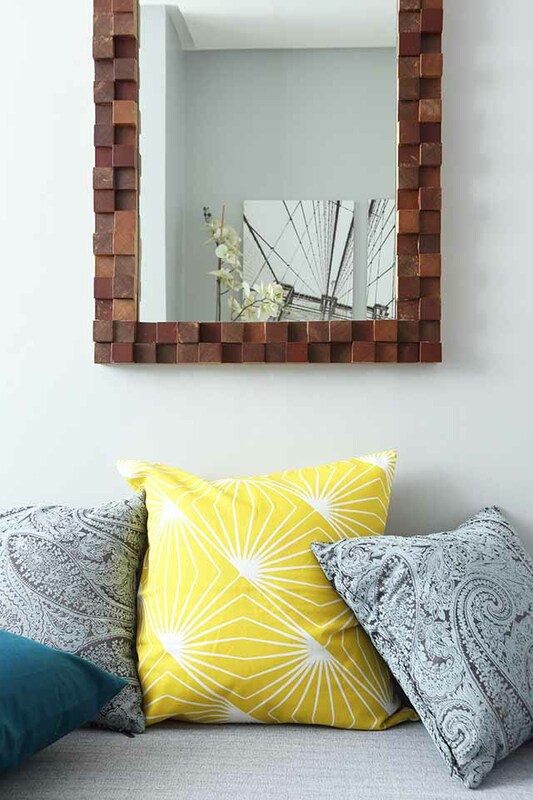 A wood-framed mirror from Avino Fine Living adds depth to the otherwise tiny space. 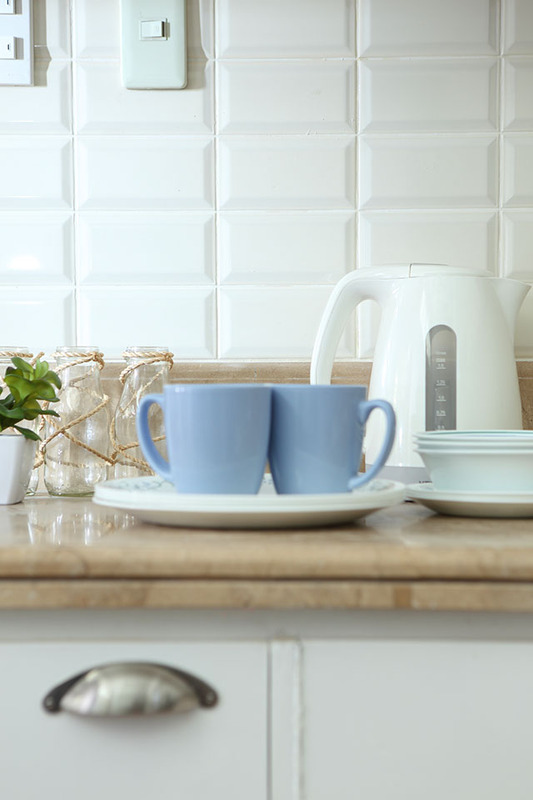 Condo kitchens are often overlooked because of its size, but you shouldn't neglect this important space. Though this kitchen initially wasn’t supposed to be part of this renovation, Van decided to have the old tiles replaced with beveled-subway tiles from La Europa Ceramica. The trendy tiles immediately update the space, and the repainted cabinets now match the light color scheme. Maf admitted that their spindly, freestanding computer table was pretty useless, so Van got rid of it and installed a more functional, built-in work area with overhead cabinets. The corner now looks cohesive to the rest of the space, and the couple now has extra overhead storage. Even though Maf and Lon’s living area is small, Van splurged on a sectional sofa bed from Avino Fine Living. The piece may be big, but it fits right into the space, and is comfy enough for movie marathons, and serves as a bed for guests who want to stay the night. 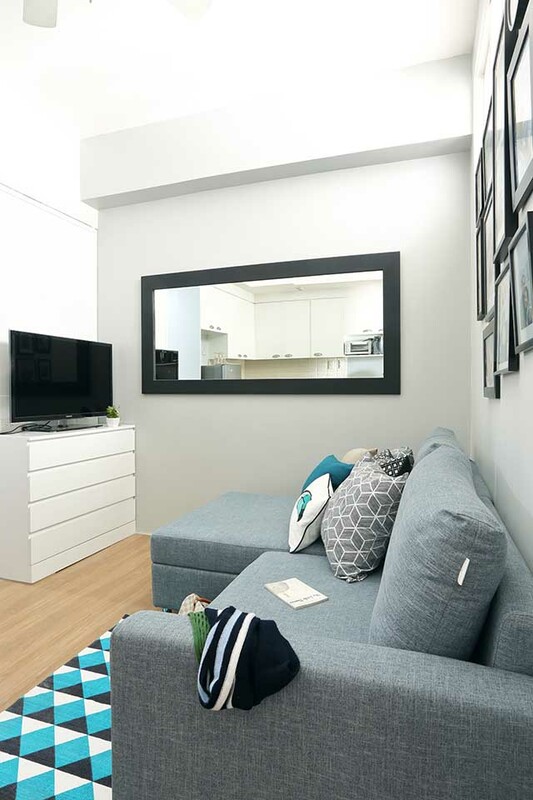 The designer suggests: “[Choose a] few pieces lang ng furniture talaga, ’wag punuin.” This gray sofa bed is the only big furniture piece in the small living area, and it’s also multi-purpose. The only décor on the walls are the family’s framed photos and a large mirror to visually enhance the space. Get in touch with interior designer Van Acuna-Solana through email at vanacuna[at]gmail.com.